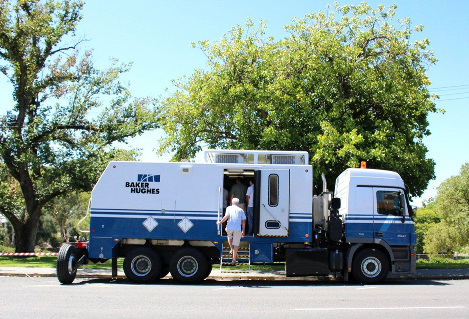 Baker Hughes kindly offered to bring along one of its brand new Logging Units to the Australian School of Petroleum at the University of Adelaide on Thursday 5th February. Staff and students were invited to get a firsthand look of the e-line truck with a tour and presentation by the company. The tour included an outside inspection of the truck including the engine components, wireline tools and the MPC pipe cutter tool. Staff and students were also given the opportunity to go inside the spacious cab and learn about all the tools and technology on-board. The extensive presentation highlighted all of the trucks components and new features available. The star feature of the million dollar machine went to the built-in coffee machine and microwave in the cab. The staff from Baker Hughes were highly friendly, informative and always open to questions. The ASP would like to kindly thank Baker Hughes for the tour and presentation of their e-line truck which was highly rewarding for all who attended.